Soka University is a unique place to have an outdoor ceremony. 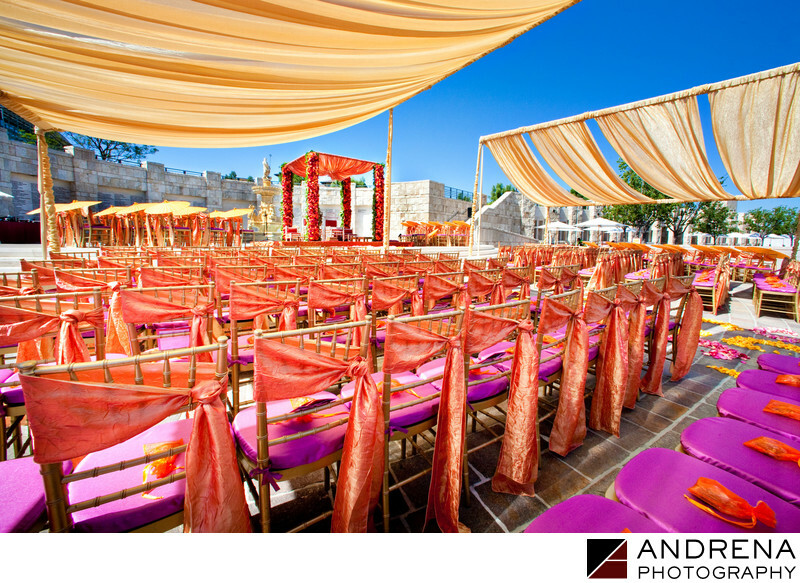 Smita Mohindra at Ethnic Essence did a beautiful job creating a magical field of color for this Hindu wedding ceremony. It was 108 degrees on this particular day, so the fabric panels helped shield the guests from the sun, while the colorful hues kept them energized and happy. I personally forgot to wear sunscreen and ended up with a horrible sunburn that I won't soon forget. Orange parasols provided some helpful relief from the sun, though not for the photographers. I love the floral-wrapped posts used for this mandap.